Update # 3 Late August Completed!!! The colours of the ocean waves include a mauvey glow and cerulean blues. The waves and ripples have dark areas that were developed with Payne’s Grey. The cresting waves have a hint of a golden glow. The beautiful colours of late August. I will spend the next two or three days staring at the painting – wondering what modifications if any are required. From there I will remove it from the stretcher bars and send off to Vancouver! I may want to do come colour balancing on this – but for now, it just feels finished. 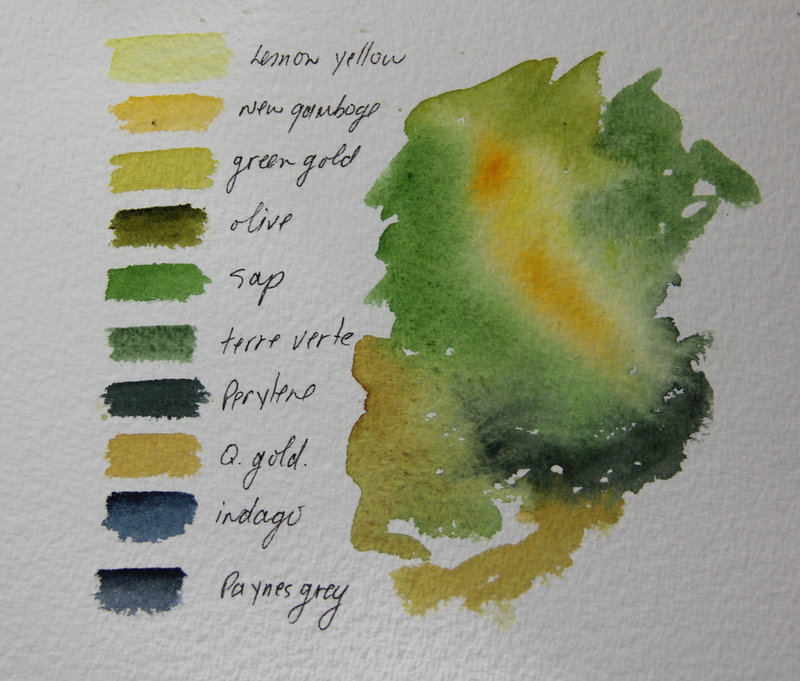 Ah…the colour of lush gardens and spring and grass and the lawn after a good rain. Green conjures up so many images in my mind. I remember that as a little girl no more than seven years old, I thought emerald-green was the most beautiful colour in the entire world. My father once drove across town (really far and in the snow) in order to take me to K-Mart to purchase a green ring that I saw there the previous day. I could not get my mind off the colour of that ring. I was completely delighted with my prize until the very next day when my finger turned green. Not a nice shade of green either, but a sort of blackish, olive-y green. And I soon learned a new word – eczema! I also learned the price of pride is pain as I continued to wear the ring! And so it began. 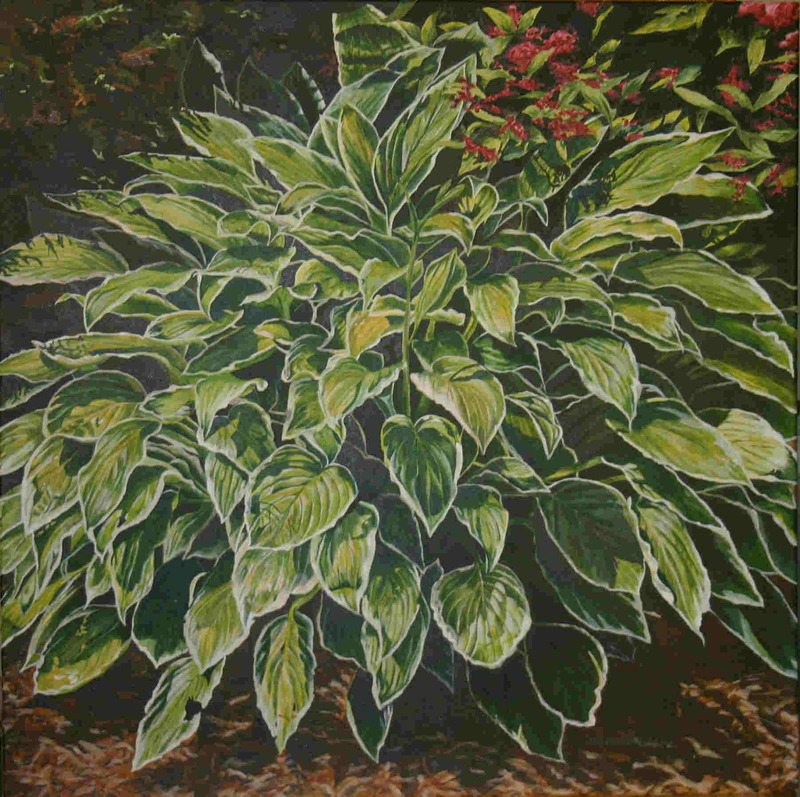 A while back I was approached by a client who saw my hosta painting “Sunshine Shadows” in acrylic. 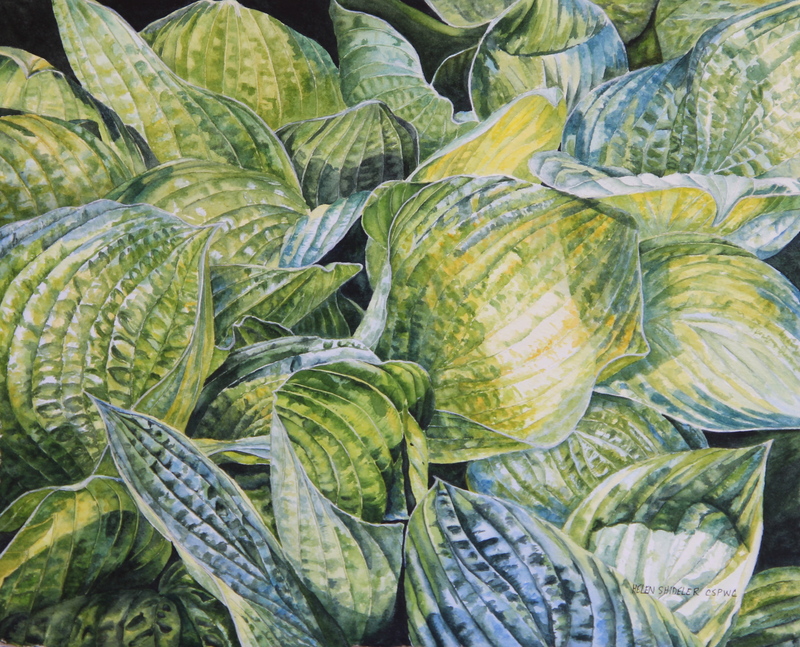 She mentioned that both she and she husband are hosta enthusiasts and they would love a hosta painting. No… no… no… not the painting I had already painted. Apparently my prized hosta is well, a common variety – please understand, I really only prize it for our ability for having kept the local deer population from eating it long enough to get a number of photos. The hosta came with the house and I love it. 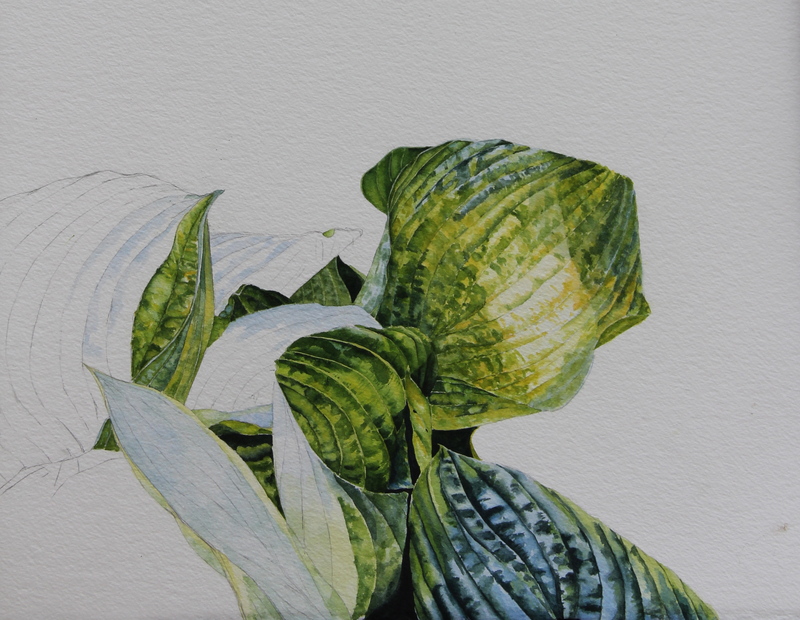 Where we live hosta are a loosing game… they are a unique family of garden plants known as deer salad! For a few years I managed to keep it safe from Bambi’s grazing eyes and voracious appetite. Then one spring day it happened. Bambi and her family cleaned out our entire hosta garden. Gnawed it down to the ground! All that was left of our hostas was a sorry stubby stand for us to lament over. 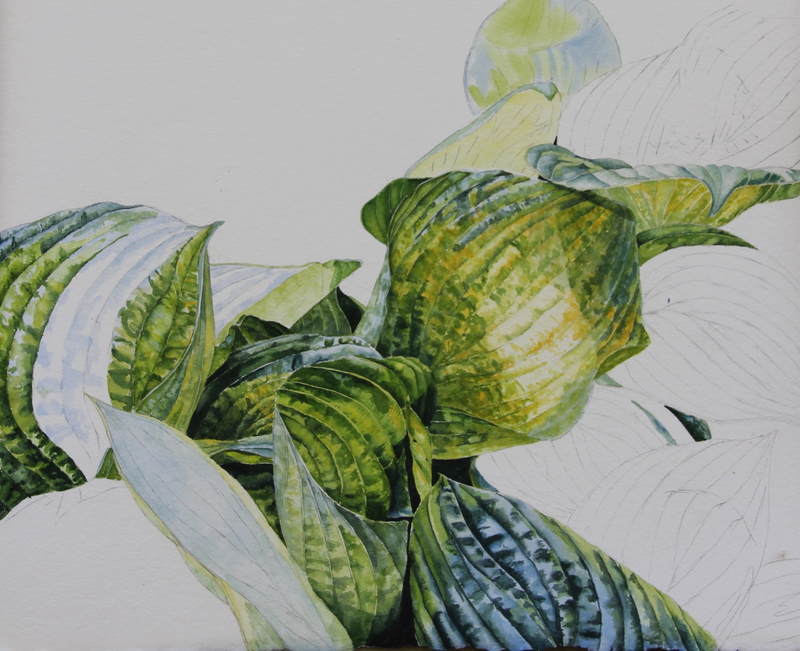 Well we pined, we plotted, we planned and we decided our hostas had to move. 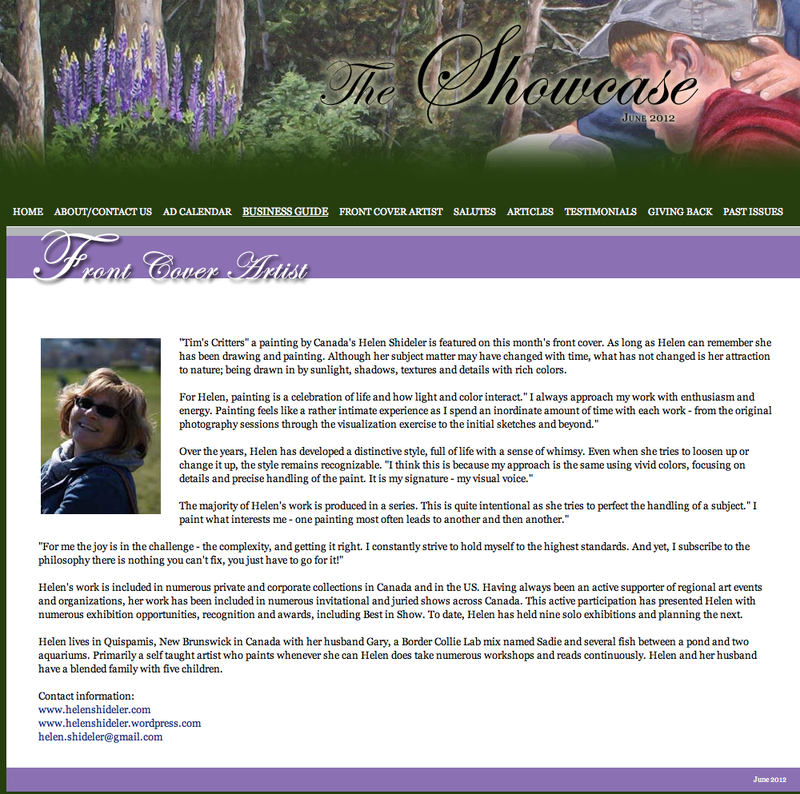 So you get the idea why we prize this particular plant – perhaps the sorry story in detail another blog post. This would likely also be accompanied with the “why I hate tulips” post – maybe next spring. And so, back to the beginning. This summer my client and I had a plan. Her family would be away for a weekend and it would be the perfect opportunity for a clandestine photo shoot. With careful plotting and many shots later, we agreed on two in particular. You know commissions, one leaf from this …one leaf from that. And Oh… I really like this colour. And so it began. This is the beginning, the WIP and I really need help in naming this one please! I have a painting commission to do of shorebirds. This is the right time of year for photographic reasearch as the birds are in the early stages of their fall migration. I know there is a shorebird conservatory a few hours from here (Johnson’s Mills Shorebird Conservatory and Interpretive Centre), but I though I would take my chances with a beach nearer to home. Also, I would never pass up the chance to head out to Micpec Beach located at the edge of Saint John. The day was overcast, slight rain, no wind and 24 degrees. Perfect beach day for an artist with a camera. 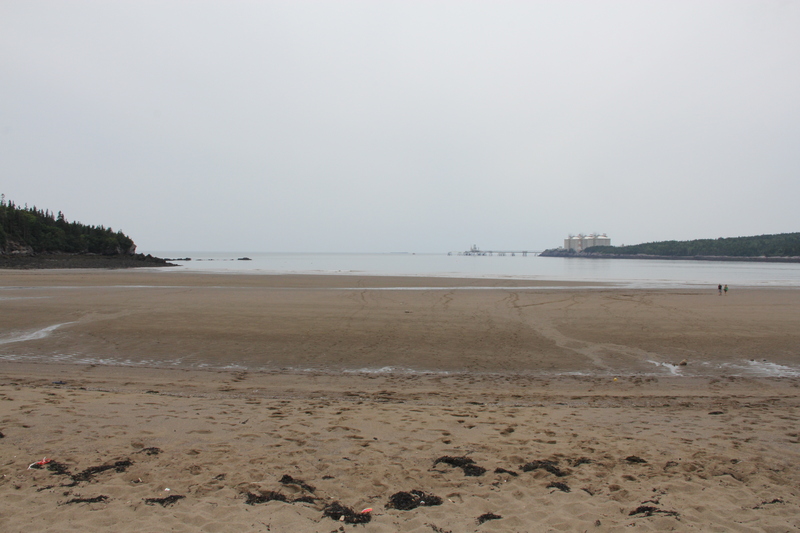 When I arrived at the beach, I was taken aback. I know a storm surge wiped out the trails and stairs a few years ago, but holy hannah I was not really prepared for what I saw. An area of parking lot was chained off – to keep visitors for f the edge that was compromised by the storm. I felt like I was on a lost and lonely overgrown movie set. 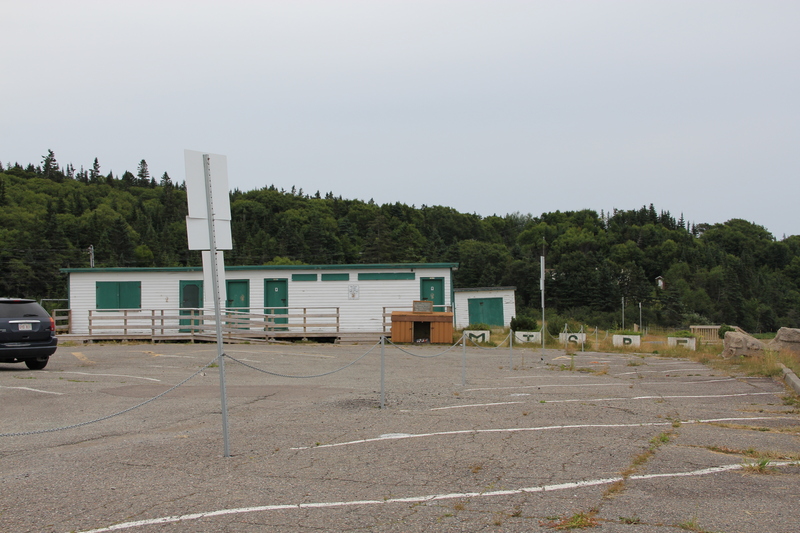 The canteen was boarded in, there are paddlelocks on the washroom and the place is suffering from lack of repair and neglect. The photo above is taken from the look out area above the beach… only a few cars there and a few people walking on the beach. Strange sense of loneliness. And so I walked the on the beach towards the fast approaching tide, happy just to be there, and wondering where the birds are. Sure there were a few species of gulls – but no shorebirds, no phalaropes, no plovers and no sign of any sandpipers. But worst of all , there were no sounds of children playing! While making my way back to my car, ever looking for a piece of beach glass I noticed the litter. Empty plastic cups, cigarette buts. Well makes me sad… mad… frustrated. Even if the place is not longer a public place, I cannot imagine why anyone would think it is ok to leave their trash behind! People!. So, at home I decided to Google the fate of the beach. This is a link to a story in the Telegraph Journal and this is a link to the save Mispec Beach Facebook page. I just asked to join this page – I hope you will also! 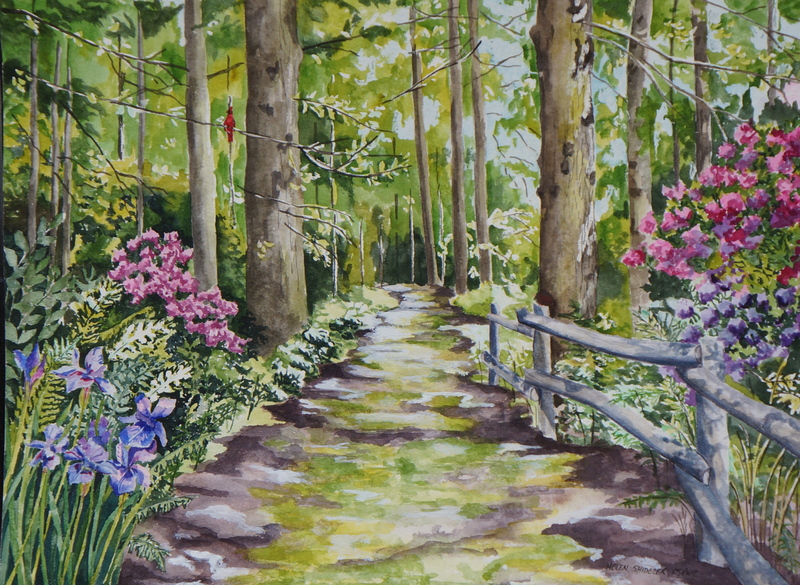 This watercolor is a composite of three photos of the same area somewhere down south. The owners of the painting are well travelled. Thy have been keeping thier eyes open for a subject that would work with their first painting. 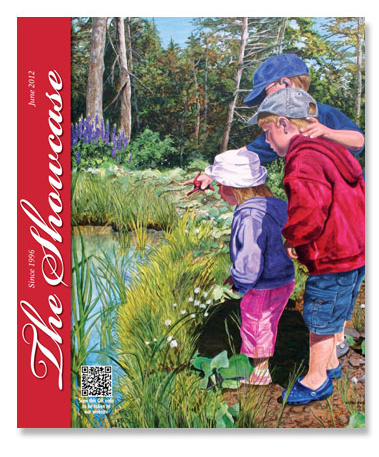 I love the colors of the water and the feeling of the painting. I would like to be there right about now. So… I have been working on this commission. 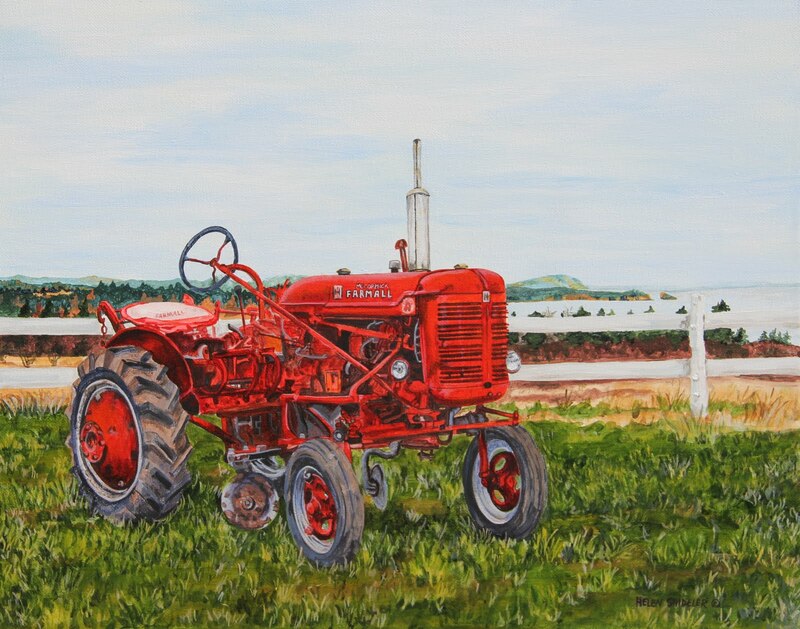 My clients purchased a painting awhile ago and wanted a companion piece in another season. They are well-travelled and were keeping an eye out for inspiration. 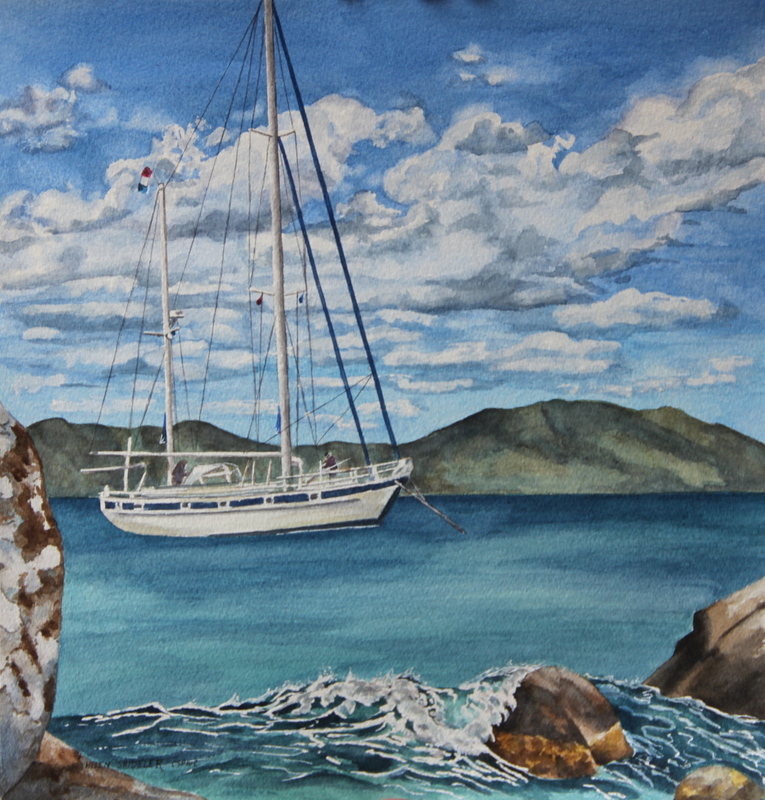 I started the painting, got mostly through it and wondered if the boat was too large. So I started it over. 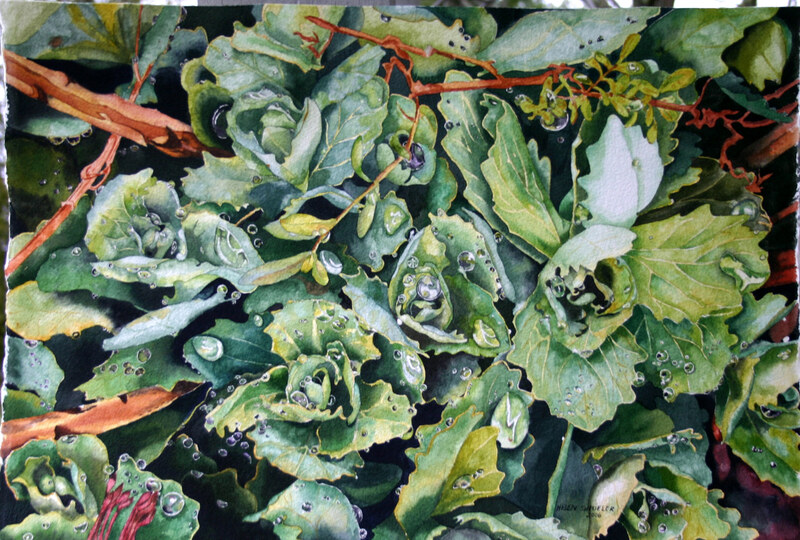 Now when I look at the first painting – I think it is fine – not finished but fine. Somehow, when a painting is in the early stages it may appear to be funky. Almost all paintings do this. And I know it – but started it over anyway. Stay tuned for progress – I will finish both and give them a choice.